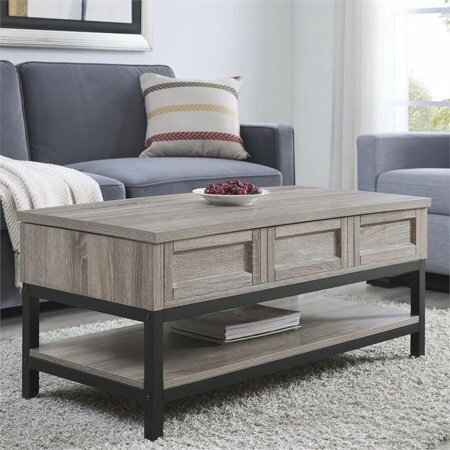 Add a touch of antique style to your sitting area with the apothecary look of the Barrett Lift Up Coffee Table. This table possesses a special lift top feature to create a hidden storage area large enough to keep your remotes, magazines and coasters. The powder coated metal and laminated particleboard gives this Lift Up Table the quality that you are looking for. The Barrett measures to be 18”h x 41.9”w x 19.6”d and is recommended to be assembled by 2 adults. Finish: Distressed Gray Oak; Materials: Metal, Paper, Powder Coating, PB; Barrett Lift Up Coffee Table resembles the popular apothecary style with hidden storage as the table top raises; Strong hinges keep the table top up making it easy to work from the most comfortable place in your home - your couch; Assembly by 2 adults is recommended; Mixed medium brown woodgrain finish and black metal legs make for the perfect combination; Constructed of sturdy particleboard and powder coated metal legs for a cost-effective but elegant piece; Complete your home furnishings with the rest of the Barrett collection; Overall Product Dimensions: 18" H x 41.9" W x 19.6" D; Overall Product Weight: 78 lbs. Add a touch of antique style to your sitting area with the apothecary look of the Barrett Lift Up Coffee Table. This table possesses a special lift top feature to create a hidden storage area large enough to keep your remotes, magazines and coasters. The powder coated metal and laminated particleboard gives this Lift Up Table the quality that you are looking for. The Barrett measures to be 18”h x 41.9”w x 19.6”d and is recommended to be assembled by 2 adults. Package came with a hole punched in on one side. This caused some damage and peeling to the top of the table. The instructions were not helpful at all. No written instructions, just a bunch of pictures splattered on a page. It also doesn't really specify the order in which to install, or finish side facing up or down. I spent about half of the time disassembling and reassembling it. Overall, I like the finish product, but I feel like I need anger therapy now.